Music has the ability to change people’s lives. It can heal broken hearts; lift spirits, and has the power to move us beyond our troubles, even if for a moment. Music holds a special place in the hearts of those facing burdens, who use it to express emotions and take their minds away from the harsh conditions they encounter. One song that helps those facing difficulties find hope and courage by turning to Jesus Christ is “I Want Jesus to Walk With Me.” The song serves as a reminder that humans can find light in a dark world. Alex Boye was born in London, England to Nigerian parents, but spent much of his youth living in foster homes after being abandoned by his mother. He discovered The Church of Jesus Christ of Latter-day Saints at age 16 through a McDonald’s co-worker and converted to the faith. In 1995, Boye formed a boy band called Awesome. They signed a major recording contract and reached the top-10 on the music charts across Europe with their debut album Rumors. In 1999, Boye left the band as he felt it was leading him toward a lifestyle he didn’t want to pursue. The following year, he moved to Salt Lake City, Utah, to pursue a solo career in Christian music and released his first album, The Love Goes On, in 2001. Boye’s music has been featured in movie soundtracks, YouTube videos, and concerts around the globe. 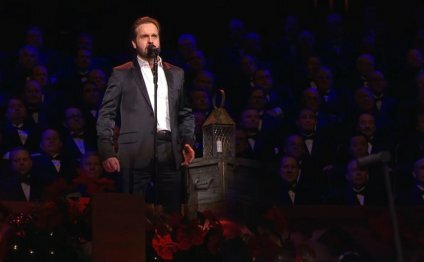 In 2006, he joined the Mormon Tabernacle Choir, while continuing his solo career. From the shores of the Cape Coast Castle in Ghana, Alex Boye, backed by “America’s Choir, ” sings “I Want Jesus to Walk With Me, ” from the album, Come, Thou Fount of Every Blessing: American Folk Hymns and Spirituals.